It is hard to believe we are already half way through November. Christmas is fast approaching. It may not feel like it just yet here, but I'm excited none-the-less. Christmas is an amazing time of the year. There are so many things to look forward to. One of my favorite traditions is pulling out my old favorite Christmas stories and sharing them with my kiddo. Where Jesus Slept is one of those stories, that you want to hang on to and add it to your Christmas book collection. This was a beautifully illustrated story! The rhyming was a good pace and kept it smooth for reading aloud. 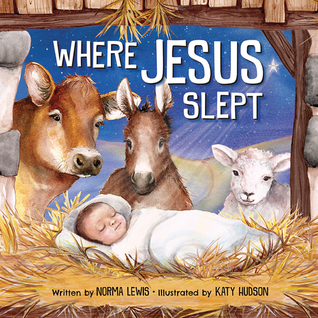 For young children, explaining the story of Jesus' birth can bring about some questions, "What is a manger?" "What does a stable look like?" This book I thought broke it down in a sweet way to point out to young children the story of baby Jesus and made it understandable to them. The color and pictures of the book just popped off of the page and brought the story all together perfectly. I also enjoyed how the book started and ended with Bible verses. They were the perfect bookends. Norma Lewis is the author of ten books, including Connecting the Coasts: The Race to Build the Transcontinental Railroad and Kasey's River Song. She lives in Grand Haven, Michigan, with a marmalade cat named Scalawag. They both love spending time with her six grandchildren, ranging in age from three to twenty. Katy Hudson was raised in Middlesbrough, United Kingdom, and started her career as a small child drawing on freshly painted walls! Her parents quickly encouraged drawing with pencil and paper instead. The idea stuck, and after earning a degree in illustration, Katy embarked on a career illustrating books, including All Things Bright and Beautiful for WorthyKids/Ideals and Bear and Duck. Katy works at a desk in a studio in an old library and likes to tap dance in her spare time. Thank you FlyBy Promotions, I recieved a copy of this book for free in exchange for an honest review.